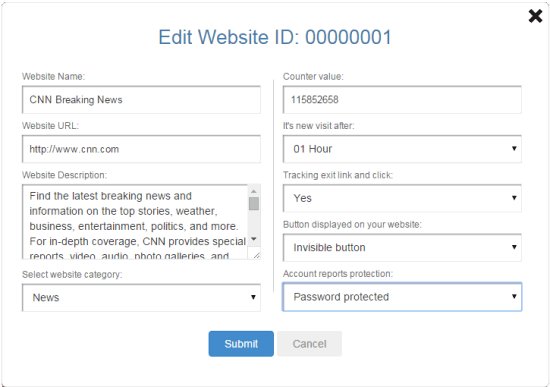 This form allows you to edit your website settings. You can update the name, description, and URL of your website. You can select the design of the AddFreeStats button displayed on your pages. An invisible option is available. You can set the initial value of the free counter provided by AFS Analytics. The 'Account protection' option must be setted on "Password protected" for private statistics access. Must be setted on "Public" for public statistics access. A visit is considered to end when a visitor leaves your site, or when he has spent more than x minutes on it. You can set this value here. Access to "edit website information" option is available via the Account drop down menu for the current website or via the “manage websites” option for another website(s) attached to your user profile.